The final conference took place on September 20th and 21st in Lyon, France. The Grand Lyon conurbation has been working on RENAISSANCE since 2005. The project has demonstrated the feasibility of large-scale high energy performance housing and office building construction combined with large integration of renewable energy. The operation covers blocks ABC of the Confluence neighbourhood. The event has been a great success by bringing together experts from main professions of the building sector : land planners, technicians of municipalities and elected representatives, architects, promoters, energy consultants, constructors, energy manager, property manager, and elected representatives of co-owners. The first day took the form of a conference organized in round tables. This interactive form gave panellists an occasion to come back on ten years of project history, lessons learnt and, most importantly, challenges they face as we go towards the generalization of low energy buildings. Many project stakeholders as well as professionals working in Grand Lyon which had only little knowledge of RENAISSANCE formed the audience. Thus, the conference has been an opportunity to both capitalize on RENAISSANCE’s experience and disseminate lessons learnt. The second day, following a two-hour discussion focused on actual challenges of land planning in La Confluence, participants were invited to visit the buildings of the demonstration site. The commented tour of wood fuel boiler rooms, and solar pannels and heat pumps on roofs, with energy managers, gave participants a concrete image of what had been discussed during the previous day. Round table 1- "Initate low energy neighbourhoods"
Round table 3 : "Guarantee systems energy performance"
Table ronde 4 : "Encourage efficient use of the energy"
Other publications on Grand Lyon experiences and lessons learnt are available in French: click here. Place: Paraninfo de la Universidad de Zaragoza. Plaza de Basilio Paraíso, 4. Within the CONCERTO RENAISSANCE project, a district scale PV monitoring tool has been developed by HESPUL. This monitoring tool can give an easy to understand overview of the good operation of all PV systems of this district as well as the overview of monthly production. This interface will be further upgraded in the coming month to include more applications. A conference called “The districts of Zaragoza in the energy crossroads. 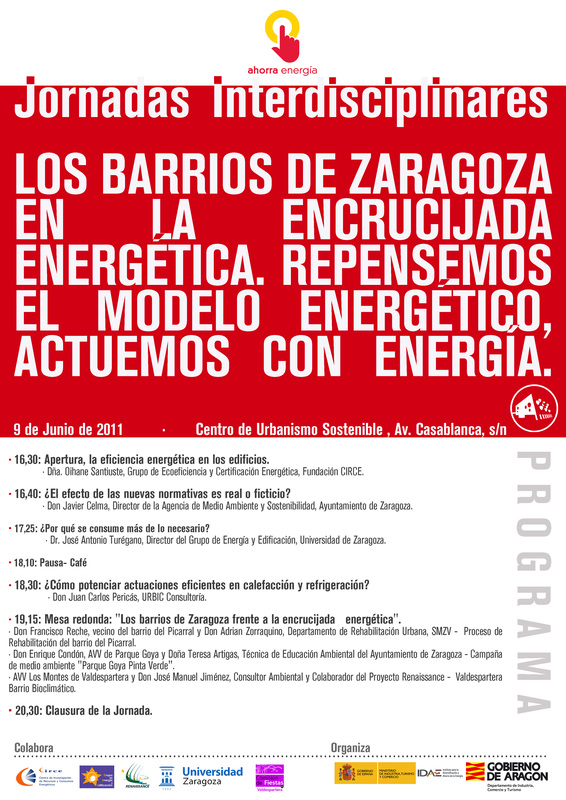 Rethinking the energy model, acting with energy” is organized in CUS (Sustanaible Urbanism Centre, Zaragoza – Spain). In that conference some partners of the project will contribute with their experience on the topic, as Ayuntamiento de Zaragoza, Universidad de Zaragoza, Sociedad Municipal Zaragoza Vivienda and URBIC. Also the neighbours will participate on that conference, explaining their own point of view and experience as users of Renaissance buildings and aware citizens. Jornadas interdisciplinares: "los barrios de Zaragoza en la encrucijada energética. Repensemos el modelo energético, actuemos con energía". La Universidad de Zaragoza participará en unas jornadas en las que se debatirá sobre el nuevo modelo energético y el papel de los barrios zaragozanos en la lucha contra el cambio climático. 16.30: Apertura, La eficiencia energética en los edificios Dña. Oihane Santiuste, Grupo de Ecoeficiencia y Certificación Energética, Fundación CIRCE. 16.40: ¿El efecto de las nuevas normativas es real o fictício? Don Javier Celma, Director de la Agencia de Medio Ambiente y Sostenibilidad, Ayuntamiento de Zaragoza. 17.25: ¿Por qué se consume más de lo necesario? Dr. José Antonio Turégano, Director del Grupo de Energía y Edificación, Universidad de Zaragoza. 18.30: ¿Cómo potenciar actuaciones eficientes en refrigeración y calefacción? Don Juan Carlos Pericás, URBIC Consultorías. 19.15: Mesa Redonda: "Los Barrios de Zaragoza frente a la encrucijada energética". Don Francisco Reche, vecino del barrio del Picarral y Don Adrián Zorraquino, Departamento de Rehabilitación Urbana, SMZV- Proceso de rehabilitación del barrio del Picarral. Don Enrique Condón, AAVV de Parque Goya y Doña Teresa Artigas, Técnica de Educación Ambiental del Ayuntamiento de Zaragoza- Campaña mediombiental "Parque Goya Pinta Verde". AVV Los Montes de Valdespartera y Don José Manuel Jiménes, Consultor Ambiental y Colaborador del Proyecto Renaissance- Valdespartera, Barrio Bioclimático. The 31st of May an International conference will be held in Milan (Italy) in the framework of the 11th RENAISSANCE meeting. ALE (Local Energy Agency) is holding new free trainings "Know How Your House Works" for CONCERTO Inhabitants. From 6th to 9th April 2011, ALE is organizing a second training session for CONCERTO inhabitants. These courses aim to inform and to provide inhabitants with the relevant elements of understanding about their dwelling’ specificities, in order to ensure a good quality of life and to encourage energy savings. 1st module: "Living well in my home and save energy"
-* How my housing has been designed? -* Why is it energy-efficient? -* What role do I play? -* How to match my behaviour to this new type of building? -* How to monitor my energy consumption? 2nd module: "Vists of the renewable energy equipments of my building"
The CONCERTO Forum, organized in Brussels on 6-7 December 2010, drew on the five years of sustainable energy policy and action experiences at cities level. On the first day, and in presence of Mr Öttinger - European Commissioner for Energy, Mr Meyer - political representatives of Grand Lyon – presented the resutlts and lessons learnt of RENAISSANCE project and outlined the Challenge and visions of Grand Lyon for the new ‘Smart Cities’ initiative. On the second day various round tables have been held by participants of all CONCERTO projects. Marc Jedlizcka (HESPUL) participated to one of them to present and debate RENAISSANCE lessons learnt regarding experiences of CONCERTO replications. The interview of Mr. Gerard Collomb Lyon’s Senator-Mayor on the participation of CONCERTO-RENAISSANCE project in the Energy and Climate Change Policy of Lyon(in French). Interview of the Architect Flanck Vella on the energy performances of the Lyon Confluence buildings (in French). Lyon Confluence : qu’est-ce qu’il y a derrière les façades ? The construction of the three blocks A, B and C in Lyon Confluence is now finished. As part of the European CONCERTO-RENAISSANCE programme, these 21 buildings, 660 new homes, 17,000 sqm of services and offices, respect specific objectives in terms of energy efficiency and the use of renewable energy sources (more than 80 %). The blocks will be officially inaugurated and the partnership between SPLA Lyon Confluence (developer), Grand Lyon and WWF will be declared. Thanks to the RENAISSANCE project, Lyon Confluence area is becoming a Sustainable Area. Jean-Marie BEMTGEN, European Directorate-General for Energy & Transport and Technical Officer of the RENAISSANCE project, and Gérard COLLOMB, Lyon’s Senator-Mayor and Grand Lyon’s President, will honour us by their presence. That day, local associations are dealing with “Energy / Alimentation / Transport” issues. They will invite Confluence’s and Lyon’s people to be concerned with green behaviour in a convivial atmosphere thanks to stands, exhibitions and activities. ALE (Local Energy Agency), a RENAISSANCE partner, will take the opportunity of the event to organize three training sessions for the inhabitants of the Blocks A, B and C. They will present the specificities of their new dwellings and some tips will provide inhabitants on « How to live in an Energy Efficient Building ». The developed topics will concern: the CONCERTO-RENAISSANCE project, the building’s specificities in terms of energy efficiency, the maintenance needed and finally the way to adopt the required green behaviour.